If it seems like we’ve been talking about Apple’s AirPods a lot lately, that’s because we have. Why? Because beginning last week Amazon somehow began offering an extremely rare discount on Apple’s highly sought-after wireless earbuds. Apple itself still can’t deliver new online orders in under a week, and yet Amazon has a ton of inventory that it’s selling at a discount! Well, Amazon’s stock sold out last week and a bunch of people missed out on the chance to snag these awesome truly wireless earbuds on sale, but they’re back in stock this week once again. 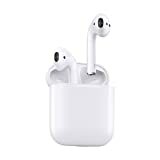 If you haven’t already grabbed an Apple MMEF2AM/A AirPods Wireless Bluetooth Headset for nearly 10% off on Amazon, it’s not too late!